Home / Inspired Creations / How To Decorate with Pearls: Glam Up Your Wedding Tables! How To Decorate with Pearls: Glam Up Your Wedding Tables! How do you bring instant glam and sophistication to your wedding reception? 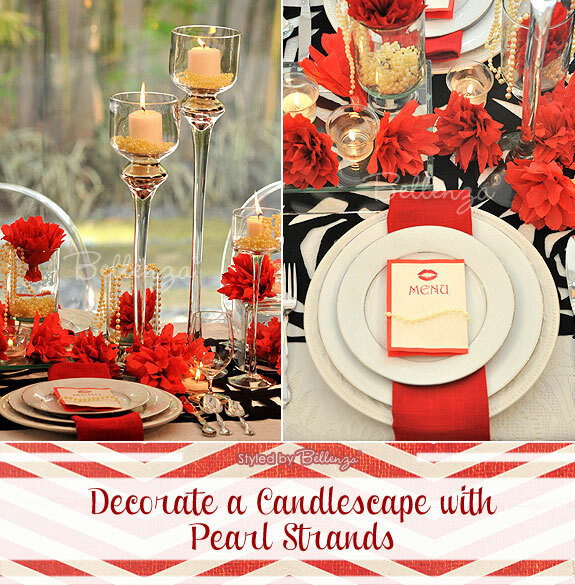 Use strands of pearls as decor accents! Don’t worry, we don’t mean genuine pearls. Even faux ones can bring that air of stylish grace to the scene, simply by ‘hanging around.’ You’ll see what we mean, as we share some photo inspiration from 6 of our own styled sets. Just see how easy it is to decorate your wedding tables with faux pearls! Create a charming tea party scene inspired with a romantic and elegant air! 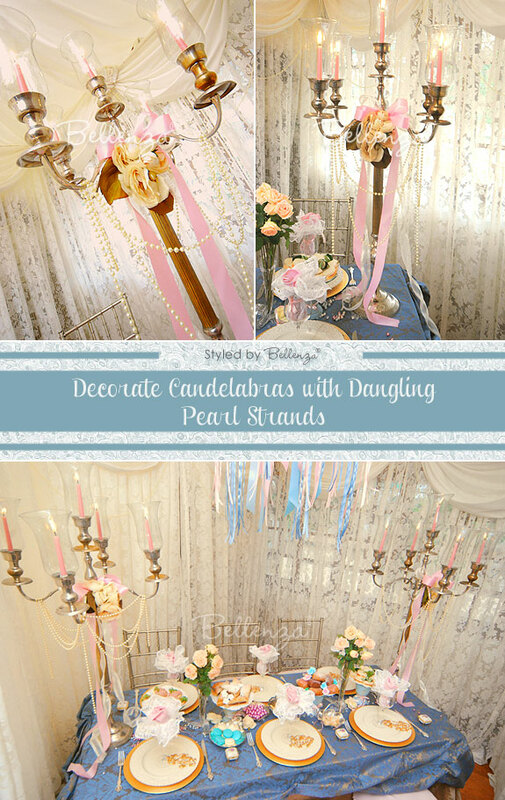 Use pearl strands as dangling decorations for candelabra and add pink flowing ribbons as accents. 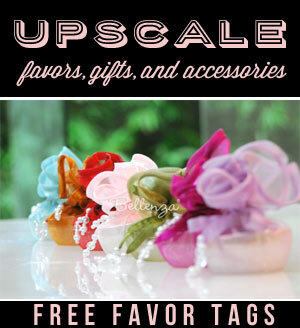 Finally, add a display of dainty tea sandwiches and pastries—a vision of frills and ruffled lace! Tip: No candelabra? You could dress up a vintage chandelier instead with dangling pearls. See a similar idea in this post. To decorate this wedding shower table, set strings of pearls in a winding pattern against a backdrop of black lace and ribbons with pink and white accents. Add paper lace doilies as plate chargers, set out pink napkins, and spread pink cutouts on the table. See our ‘Modern vintage’ styled shoot for more details. Tip: In keeping with the Old World look of this tablescape, consider using pearls as wine glass charms or napkin rings. In a color palette of rich browns and burnished tones, pearls add luster to the scene in an ultra glam way. Use gleaming brass vases, tea lights in seashell trays, and the jewels of the sea—pearls—to gracefully adorn the table top from one end to the other! 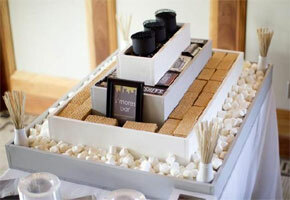 See glam beach reception table for more inspiration. Tip: As a variation of the sand-covered table number shown here, why not have each number encrusted with tiny pearls? 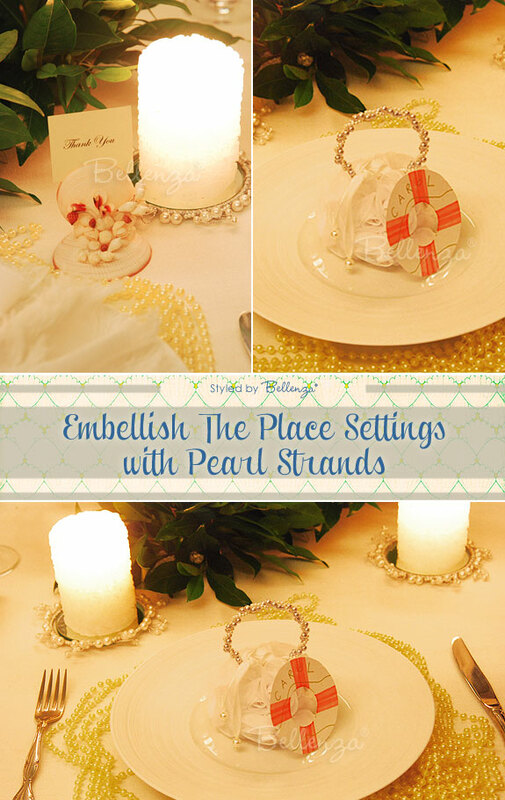 Mimic the look of plate chargers with strands upon strands of pearls. In this nautical place setting, only a few pearl accents are used to create a stunning yet simple look that is very doable! Candles set atop pearl-accented plates lend a hand at producing a romantic glow! Tip: You can also create napkin rings using pearls. Fold the table napkins in a roll, tie a short strand of pearls around the middle part of each one, and assemble on the place settings. 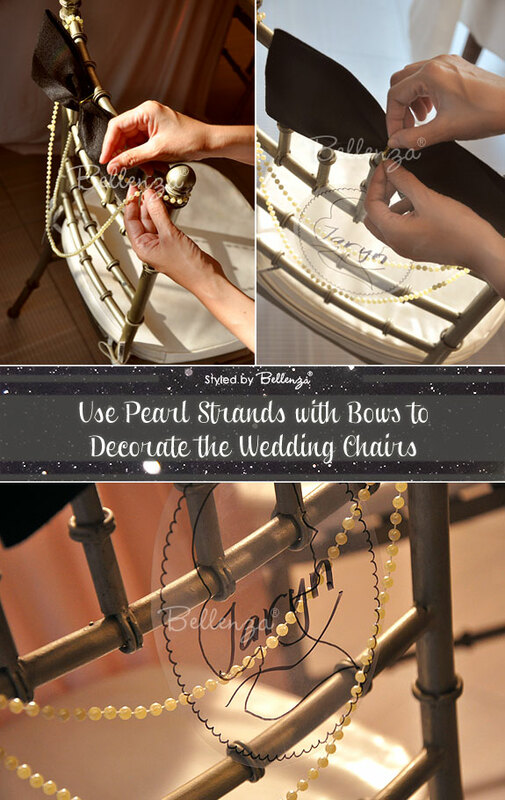 Look beyond your reception tables and see how pearls can be used as elegant chair decor! Here, we have our very own tutorial on how you can apply pearl strands together with a black velvet bow! Tip: This chair decor idea could actually be an echo of the trimmings along the aisle at your wedding ceremony. How classic would that look! 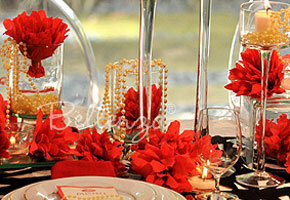 Give a Valentine’s-themed table setting an edgy look with dramatic black added to the traditional red and white. Then, use pearls to add a luxe flair to the centerpieces—lining sleek glass candle holders and spilling out of cylinder vases holding red paper flowers. Tip: This same draping effect would certainly add flair to your guest book table, dessert buffet, drinks bar, or favors display! 1) Bouquet – Decorate your bridal bouquet with a band of pearls and a mini cameo. 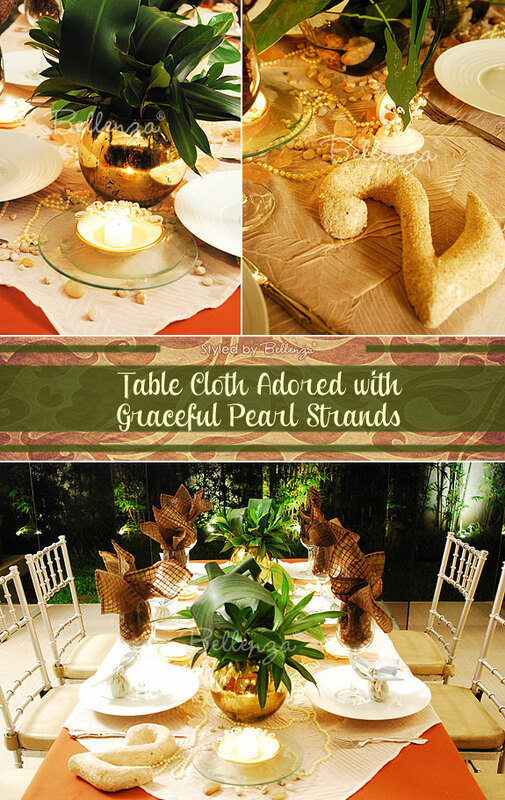 2) Dessert Table – Drape pearl strands by attaching them to the table signage or backdrop. These would look lovely when your wedding cake is decorated with sugar pearls, too! 3) Guestbook Table – Use pearl strands to adorn the guestbook. Add a quill, some vintage-looking cards, antique suitcases, and you’ll have a truly elegant display! 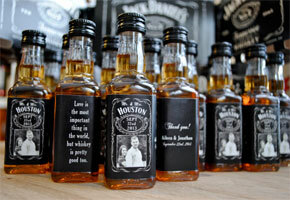 A perfect idea for a travel themed wedding with vintage details. 4) Table numbers – Present your table numbers in fancy frames, then embellish them with strings of pearls. 5) Garlands – Instead of the usual bunting, use pearls to create magical overhead garlands. If you’ve used pearls as decorative accents at your own wedding ceremony, reception or bridal shower, do share a photo or two. We’d love to inspire others with your ideas! Previous Flower Girl Fun: Alternative Ideas to Say ‘Goodbye’ to the Basket! Next Tutorials for: How to Use Lace Doilies as Wedding Decorations!